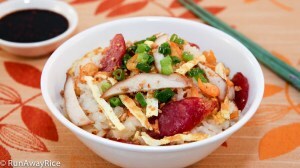 This recipe for Sticky Rice and Mung Bean (Xoi Xeo) is a classic Vietnamese breakfast dish. Sticky Rice is made from glutinous or sweet rice. 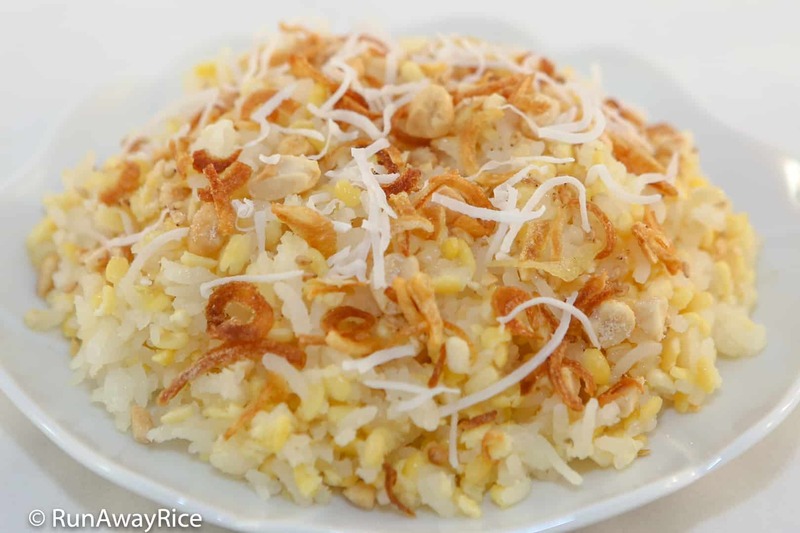 It’s typically steamed and combined with some variety of beans and then topped with chopped peanuts, shredded coconut and fried onions for a sweet and savory taste. My recipe shortcut is to use a rice cooker and it’s so much easier than steaming. On Sundays, I’ll make a batch and divide into small containers. Then I pack a portion each day and have a quick breakfast to enjoy at work. The Sticky Rice and Mung Bean just needs to be warmed in the microwave for about a minute before it’s nice and hot. This also makes a great anytime snack for the kiddies! Wash and rinse the mung bean until the water is clear (approximately 4 times). Soak beans for 2 hours. 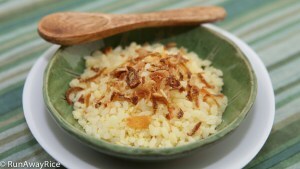 Wash and rinse the glutinous rice until the water is clear (approximately 3 times). Soak rice for 1 hour. Drain both the mung bean and glutinous rice and place into separate bowls. Add glutinous rice into the rice cooker. Use a spatula to spread the rice evenly along the bottom of the rice cooker. Add the mung bean, salt and water. Spread the beans evenly and make sure they are touching the water. Close the lid and set the rice cooker to “Cook”. In approximately 20 minutes, the rice cooker button switches from the “Cook” to “Warm” function. When it does this, open the lid and quickly combine the rice and mung bean. Scrape the bottom of the rice cooker. (This helps to keep the rice from sticking and burning. ) Close the lid and unplug the rice cooker. Let everything cook for another 10 minutes. Put the peanuts in a small food processor and chop for 10 seconds. Add the sesame seeds and chop for another 10 seconds. Add sugar and salt and pulse for 5 seconds to mix everything well. 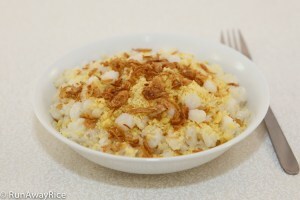 Serve the Sticky Rice and Mung bean with generous amounts of the peanut topping. Optionally add shredded coconut and fried onions. Chi Trang oi, this recipe is spot on! Thank you very much for sharing! I was wondering if you would not mind sharing the glutinous rice with peanuts recipe one day. My friends and I have made several attempts at cooking this but no luck so far as either the peanuts are still raw or the glutinous rice is too congee like. Thank you! Glad to hear you enjoyed this recipe. Of course I will share glutinous rice with peanuts. I love this recipe too! Thank you for the video. Love it. Tried it and it came out perfect. LOL! I agree–cooking should be effortless and still taste good 🙂 I am constantly looking for shortcuts especially since Viet cooking takes so much time and I love sharing my tips and tricks. Appreciate your support friend!